This is an exciting time of year – we’re in the middle of competition season, recital planning and choreography, and planning and preparing for our summer and next school year. Our instructors have been working HARD on class evaluations and recommendations – and they just went home via email a few moments ago. We have dedicated so much time and energy into our curriculum and evaluation system – we think it’s one of the big pieces that sets our dance studio apart from the rest. We pour so much time and energy into helping each individual dancer on their journey in dance and making sure they are getting the most out of their time in class to help them achieve their goals. We have one of the most detailed evaluation reports I have ever seen in our industry – because we know that students value the detailed feedback from instructors and that by giving as much information to students and parents as possible, we all can partner together to help our students achieve their specific goals. Every instructor fills out a unique evaluation form for each class (so dancers in three classes will get three evaluations) – using our curriculum and syllabus for each level. The evaluation forms have three sections: Attitude, General Technique, and specific-to-that-class Key Skills. Each skill is marked with a 1 for new skill (or needs work), 2 for developing skill, and 3 for a mastered or completed skill. The attitude section is for things like consistent attendance, work ethic in class, listening, showing respect to other dancers and the instructor, etc. The technique section covers fundamentals of that dance style (for example, in ballet – straight knees, pointed feet, tall posture, and rhythm and musicality). The third section covers specific skills to that class level (for example, one of the key skills in Ballet 3 is a double pirouette). After these, teachers write comments to each student, and then their recommendation for classes for the next season. Our teachers have done an incredible job preparing thoughtful evaluations and recommendations – know that lots of time has been invested in each form for your student! We want students to know that we are watching and paying attention in class, and to let them know objectively how they are progressing – and know that students take written feedback to heart when sometimes it’s easy to forget comments said during class. Please remember that most students spend at least two years in every Graded Technique level. Sometimes, dancers who have progressed quickly through the first levels catch up to that average of two years in levels later on. Every dancer’s journey is completely unique – your dancer may not progress at the same rate as their friends or classmates, and that’s OK.
Our hope is that these evaluations can be practice for kids to handle exciting news with kindness and disappointments with grace. What a great, safe way to practice dealing with these real-life situations in a low-stakes way (class placement seems like a big deal right now, but in a dancer’s total career, placement for one year does not make an impact!). All of our most advanced dancers have had disappointing recommendation or audition results – and they grew to that next level of skill and passion after working through conversations about that. This can equip kids with strength and the ability to have a difficult conversation that will be an asset to them throughout their life! I was so disappointed when I got placed on the “C Team” in middle school basketball. I knew that was the lowest level team, my friends made the “A Team”, and I sobbed about that and almost quit when those lists went up. My parents reassured me that the mission in playing basketball (or any sport or activity) was to be a part of a team, to improve my skills, and the name of the team I was placed on doesn’t impact that mission at all. I reluctantly continued – and one week later, the name of my team didn’t matter any more. Because of my placement, I was able to shoot and score several points in our “C Team” games – and I realized when watching the “A Team” that I NEVER would have had the chance to play in any games – or if I did, I wouldn’t have been set up to succeed. All of our teaching staff has one goal – the success of each and every student. Our recommendations for each kid are designed to help them be successful in dance. If you or your dancer has a question about their recommendation, please have them ask their teacher! Dance has its own terminology, and written or typed comments about movement quality may be hard to understand. If your student needs some clarification on their comments or evaluations, we’re happy to help! If your dancer is disappointed in their evaluation, sometimes we’ve had students get disappointing recommendations and turn that into fuel to kick things into gear and do what it takes to level up. Doubling up on a genre for the summer and extra stretching or practice on a specific skill at home can change an initial recommendation! These evaluations show recommendations based on class performance today – but it is absolutely possible that with focused energy and extra work, they can change! A conversation with your instructor can equip your dancer with the knowledge they need to set and achieve a goal to meet the requirements of the next level. 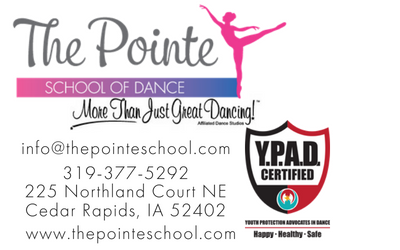 We should have our 2019-2020 class schedule online in the next two weeks – dancers enrolled in summer dance (Graded Technique classes may start to fill once recommendations all get home!) get the first chance to register, then the second tier of registration is for dancers enrolled this school year who are taking the summer off, and then we’ll open registration up to the public. Register for next year early – our most popular class times fill up quickly! 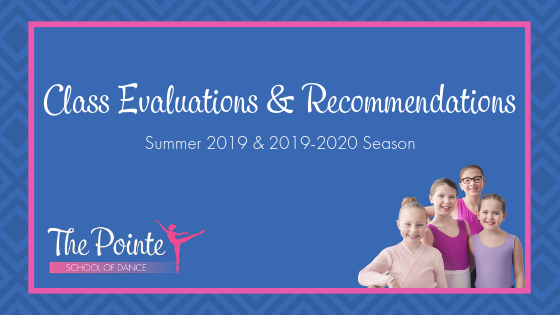 We are so thankful for you and your dancer – and hope that we can work together to make this evaluation process a positive and helpful one for your dancer! We are always here to answer questions and work with you to make a plan to help your dancer reach their goals.